Floral Danielle: Wednesday wishlist #8 - Festival outfits I wish to own! 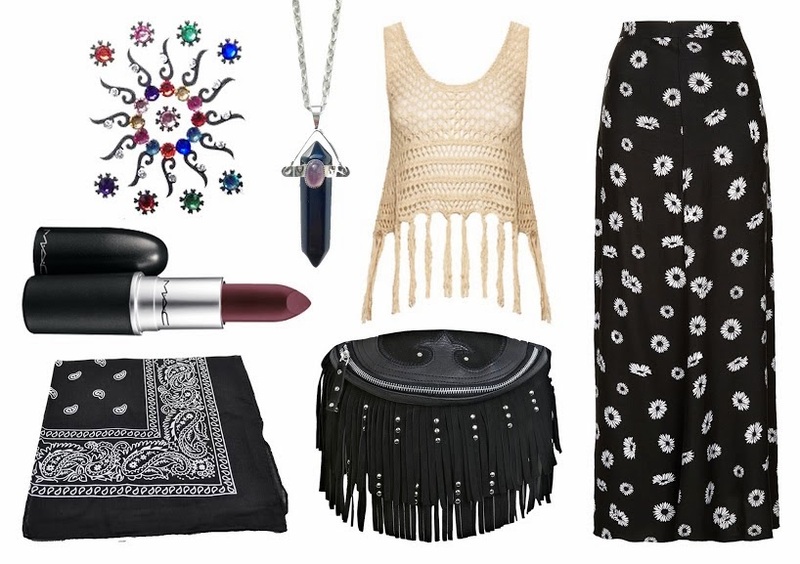 Wednesday wishlist #8 - Festival outfits I wish to own! I've been on a bit of a kimono hunt for a long time now, even before I booked the festival, but I've not really found one that has blown me away. This one however, I instantly fell in love with! I love the patchwork style patterns and I love the colours too. I would probably add some fringing to the bottom too, and Glamorous also does 20% off student discount too so it would only be a bargain £16! Fragrance Direct is literally my guilty pleasure when it comes to beauty. Where else can you get your favourite lippy for under £2?! The Kate Moss lipsticks are usually around £5, but if you know your favourite shade, you may as well stock up on a few from Fragrance Direct! My favourite shade is this dark red one called '01'. This dress reminds me of when I used to do ballet when I was younger, and the way you had to wrap the cardigans around yourself. I love the simplicity of it, and the neckline looks so flattering. It's gone into the sale for a bargain £12.50, so I think it's fate really! Obviously you've seen the River Island matte black cut-out boots, but this is the first time I've seen them in patent, and I think I actually prefer them like this! I've always loved the way bindis look and I've never really had an excuse to wear one, so now is my chance! This pack in particular has so many different colours and designs all in one. How gorgeous is this necklace?! There are so many things I want to buy from Empty Casket, but this one I think I want the most! I love the colours as you never really see dark crystals, they're usually all light colours! I actually already ordered myself this necklace, but I think that everyone else should make an order from Little Teacup jewellery too! I've known about it for ages, as fellow blogger Chelsea from Chelsea Jade Loves is the owner. It's so cheap and affordable, and she's lovely! I absolutely love this tassel crochet crop top! I wish I could crochet so that I could make myself lots of lovely pieces! This is such an affordable price though. Unfortuntely it is currently sold out, but when it comes back into stock, it's mine! Wah it makes me sad how expensive Mac lipsticks are nowadays! :( This shade is so lovely though, not too dark and not too light! I only have a few Mac lipsticks as they're expensive and I don't use them often, but this one might have to be next! I'm actually terrified about what my hair is going to look like if it rains! I'm going to buy myself this black bandana JUST IN CASE, and hopefully I won't have to use it for hiding my hair. But I do think it'll look cute tied in a little bow, and for 99p you can't go wrong! I must admit, I wouldn't pay £35.00 for a bag unless I was in love with it, let alone a bumbag, but this design is super sweet. I might have to invest in a cheap version and add the studs and fringing myself, but I do love the look of this one! Are you off to any festivals this year? Please link below if you have any wishlist posts, I need inspiration! The kimono on the first outfit is so lovely! Those river island cut out boots, i need them! These are great! I love the top look, Kate lipstick - of course!